And during its last dive through the icy plumes that Enceladus erupts into space in October 2015, the Cassini spacecraft has finally managed to find it – in the form of molecular hydrogen. The finding, published in Science, means the moon can now be considered highly likely to be suitable to host microbial life. In fact, the results should undermine the last strong objection from those who argue it could not. Enceladus is a small (502km in diameter) moon with an icy surface, a rocky interior and an ocean of liquid water sandwiched between the two. Cassini discovered back in 2005 that Enceladus is venting water into space, in the form of plumes of ice crystals escaping from cracks in the surface. For a decade, Enceladus was the only icy moon where this was known to happen, but plumes have recently been found on Europa, too, a larger icy moon of Jupiter. Cassini’s discovery led to it being re-tasked to fly through Enceladus’s plumes. There, in addition to water, it was able to identify traces of methane, ammonia, carbon monoxide, carbon dioxide, simple organic molecules and salts. Cutaway view inside Enceladus, showing where hot water and rock interact below the ice. Eventually, in March 2015, it detected microscopic particles of silica. By then, the composition of the plumes showed almost every sign that ocean water had reacted chemically with heated rock – altering the minerals of the rocky silicate seabed while the water became rich in chemicals. Presumably, the ocean water is drawn into the rock, becomes heated, reacts chemically, and escapes back up to the ocean via “hydrothermal vents”. These exist on the floor of the Earth’s oceans, too, where the chemically charged water supports a rich ecology of microbes and other, more complex, life forms – requiring no sunlight. The only missing evidence of water-rock chemical reactions in Enceladus was molecules of hydrogen, which should be released as a byproduct of the water-rock reactions. Searching for hydrogen was a key goal of Cassini’s final and closest dive through the plumes. The new study unveils how hydrogen was detected during the frantic half-minute when Cassini was about 120km above the surface of Enceladus, whizzing through a plume at 8.5km per second. This was achieved by operating the mass spectrometer (an instrument which knocks electrons off chemical substances and sorts them based on their mass-to-charge ratio) in a special mode. It admitted plume material directly into the instrument’s detection chamber to avoid the possibility of hydrogen being generated by plume-water reacting with the metallic components of the instrument itself. Hydrogen is of immense significance, because its presence along with hot water and rock would enable simple microbes to make a living. When dissolved carbon dioxide reacts with dissolved hydrogen, it produces methane and water. This chemical reaction releases energy that organisms can use to drive their metabolism. There are many kinds of “methanogenic” organisms at deep sea hydrothermal vents on Earth that do this. 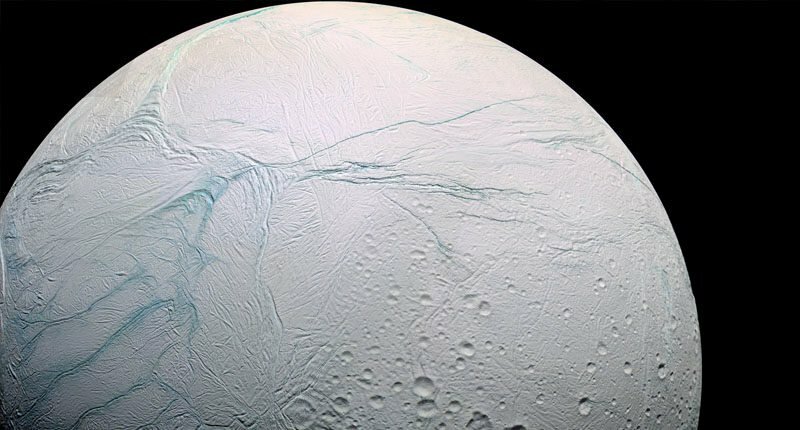 Now that we know Enceladus has all the necessary ingredients for this to happen, we are lacking only the proof of life itself. For that we will need a purpose-built mission, such as the Enceladus Life Finder (ELF). This would collect and analyse any complex organic molecules in the plumes. It is hard to imagine a more important goal for solar system exploration than establishing whether a habitable environment, such as the warm bottom of Enceladus’s ocean, actually does host life. Enceladus’s south polar plumes, as seen by Cassini November 30 2010. Enceladus is a long way from Earth. If we were able to prove that it hosts life, it would be highly likely that such life had originated there, independently of life on Earth. That would be a crucial discovery. It would provide evidence to suggest that our galaxy is teeming with life, because if life began independently on two different bodies in our solar system, then surely it also got going on many of the potentially habitable planets that we are now finding around other stars. Enceladus is a tiny world, and the amount of available energy and nutrients is small. Few scientists therefore expect it to host an ecosystem consisting of more than simple microbes. The much larger Europa, if it has life too, is a better prospect. How Cassini will end, on September 15, 2017. However, to protect Enceladus from the slightest risk of contamination by any terrestrial microbes that accidentally hitched a ride on Cassini, the craft will not be allowed to become a derelict object that might eventually crash onto its surface. Instead, the mission is facing its “grand finale”, a series of 22 orbits in which it will pass spectacularly between Saturn and its innermost ring. This will end with Cassini burning up in Saturn’s atmosphere.